Moosic, Pa. - Coming together for the greater good. All baseball teams try to accomplish it on the field. 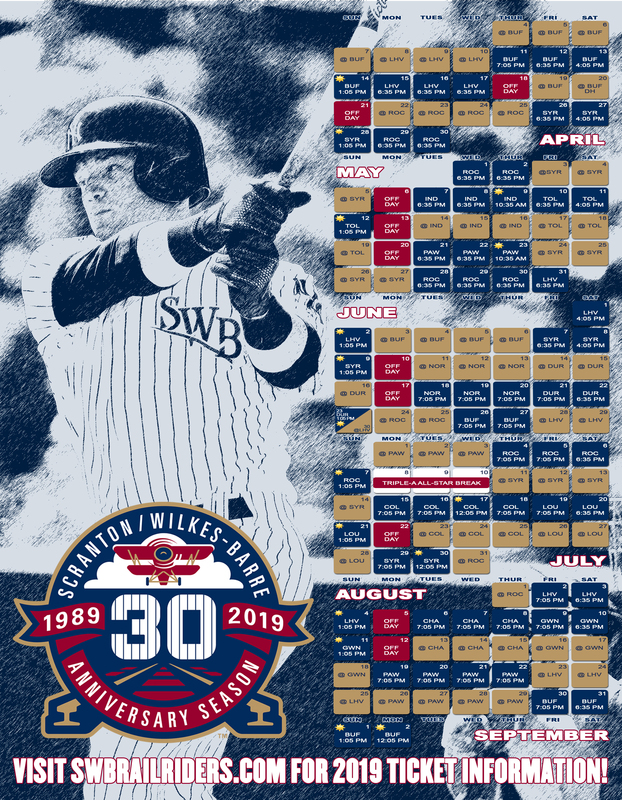 In the case of the Scranton/Wilkes-Barre RailRiders (Triple-A/New York Yankees) - the off-the-field efforts in that same vein added up to a whole lot of good to date in 2014. - Five jersey auctions raised over $20,000 to benefit: Hunt of a Lifetime, IamMore Foundation, Allied Health Services, Fisher House and the Dave Miley HOF Scholarship Fund. - The debut of the team's Fit Track program, presented by Odak. - Another successful HOPE Week in concert with the rest of the New York Yankees organization. - An increase in charitable giving from $217,000 to over $360,000 including cash and in-kind gifts. - Over 550 hours volunteered in the community by full-time staff, players and coaches. - Over 200 mascot appearances. - Support of our military with the Metlife Military Appreciation program, Honor Guard program, veterans parade appearances in Scranton and Wilkes-Barre, and a players/field staff visit to the Gino Merli Veterans Center. - The RailRiders and Kost Tire and Auto raised $14,000 for the Boys and Girls Clubs of NEPA with the Hurl the Pearl promotion (up $2,000 from 2013). The RailRiders franchise prides itself on engaging with the community. The signature addition in that regard for 2014 - the Fit Track program. Fit Track's inaugural year sported over 30 schools in NEPA and over 12,000 children. It encourages children to develop healthy habits during their youth that will transition into adulthood. The Fit Track focuses on three main healthy behaviors: being active for 60 minutes each day; making healthy food choices; and getting at least eight hours of sleep a night. Each enrolled child received a free RailRiders jump rope to aid in their physical activity. Each child that completed the program received a free ticket to one of four RailRiders home games with Fit Trackers honored on the field during the pre-game festivities. The Community Organization of the Game program, presented by DePietro's Pharmacy, came back for its second season. Each of the team's 72 home games spotlighted a local non-profit/civic organization. That COG had the opportunity to spread its message to every guest through a pre-game on-field interview, a ceremonial first pitch, an on-air radio interview and a concourse table display. A standard from previous years, the Adopt-A-Field program, renovated four local fields (one high school field; one softball field; two youth fields). Front office staff and grounds crew members spent the entire day at each park cutting the infield, rebuilding pitching mounds, fertilizing/mowing grass, cleaning dugouts and more. The fields were chosen through a contest on the team's website with fan votes deciding the lucky winners. As the top affiliate of the New York Yankees, the RailRiders proudly played their part in the organization's annual HOPE (Helping Others Persevere and Excel) Week effort. The week-long community outreach program's purpose is to touch as many lives as possible in your area. Members of the RailRiders' coaching staff, players and front office folks made their way throughout NEPA. HOPE Week 2014 in SWB included partnerships with the Children's Miracle Network and Make-A-Wish Foundation to welcome children in for an unforgettable day; shaved heads and over $13,000 raised for childhood cancer research; a visit to the Gino Merli Veterans Center; and laser tag with the NEPA Boys and Girls Club. The RailRiders' Military Appreciation program was brought back to show the team's support of our nation's active and retired military. The serviceperson and his/her family were honored. Activities included complimentary game tickets, a pre-game on-field interview and a ceremonial first pitch. SWB's patriotic pride continued by Setting A Seat Aside. To honor men and women affiliated with our nation's military whom could not be at PNC Field, one significant seat (section 13, row 15, seat one) remains forever empty and unsold. "2014 was a great year," said community relations manager Rachel Mark. "Seeing the impact our community outreach makes in NEPA is priceless. We are excited to continue these efforts and watch them grow in 2015."